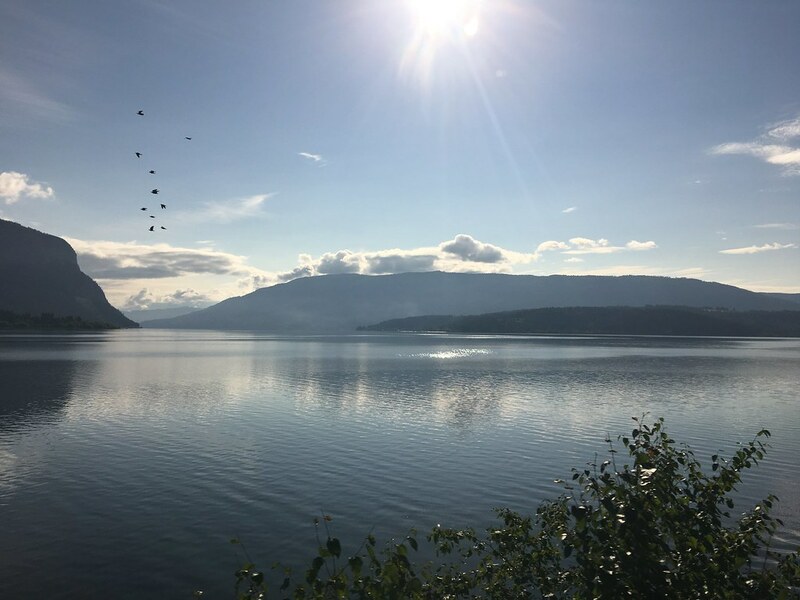 During the summer, my parents and I took a once-in-a-lifetime trip to Canada, which had been a dream of my Dad's for a long time. 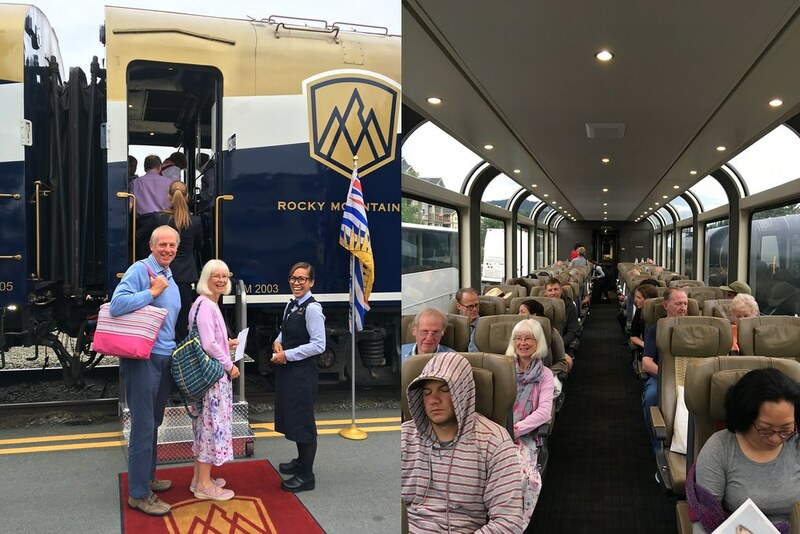 However, the main highlight was set to be a trip on the Rocky Mountaineer, a luxury train which rumbles and chugs its way on days-long journeys through the stunning scenery of the Rocky Mountains. This was our raison d'etre, and so today I'm going to share an extract from my travel journal about the two days we spent on board. Choo choo! We were up early doors (5:15, ouch!) 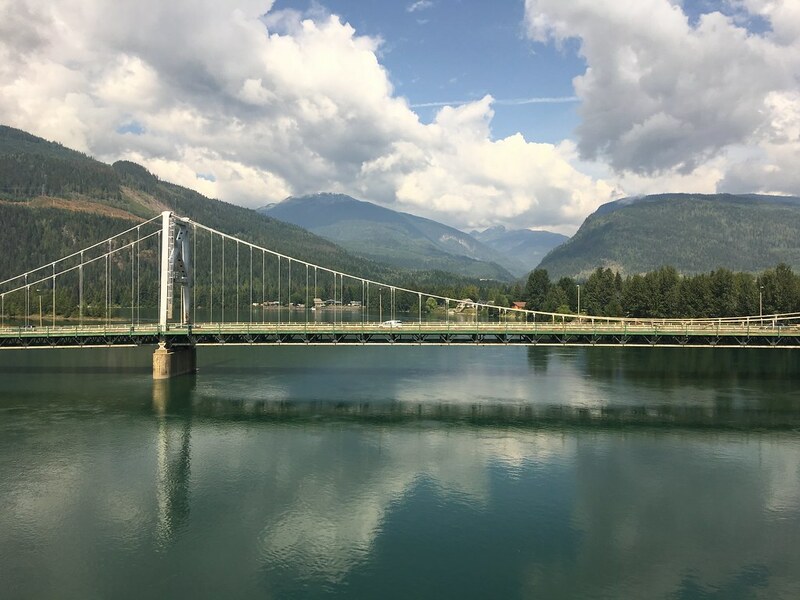 to clear out of our Vancouver Airbnb and get a cab to the rocky Mountaineer station. The adventure had begun! 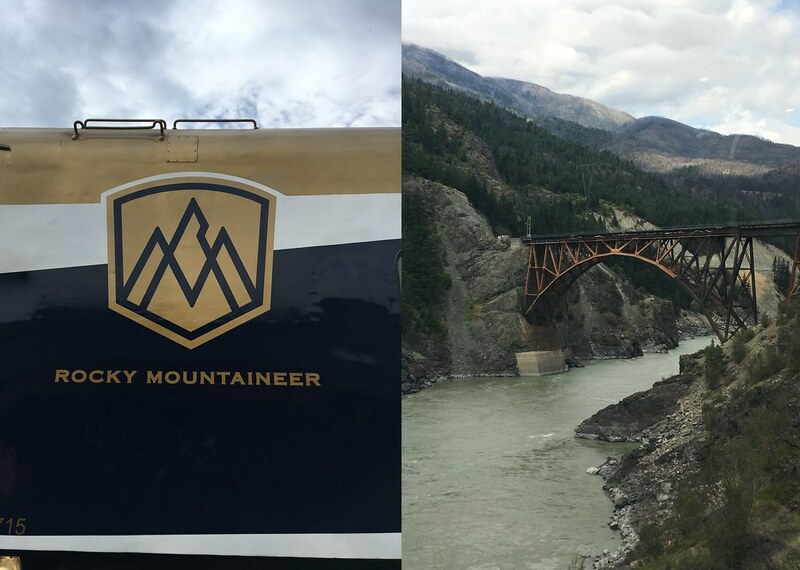 And it immediately felt pretty fancy as our cab was met by station staff who wheeled our luggage through a special Rocky Mountaineer station to check in. They whisked it off and we had an hour to spend helping ourselves to free tea and coffee and listening to a chap serenade us on a grand piano. So classy and civilised! There was a bag piper at boarding time, a ceremonial train whistle and a call of “all aboard!” and then we were directed to our carriage, CB02, where we walked the red carpet between a pair of flags, met our hosts Caitlin and Lynn and took our seats, across the aisle from each other. The carriage was huge: so light and spacious with comfortable seats and before long, we were given a sparkling peach drink to toast the journey and we were off! 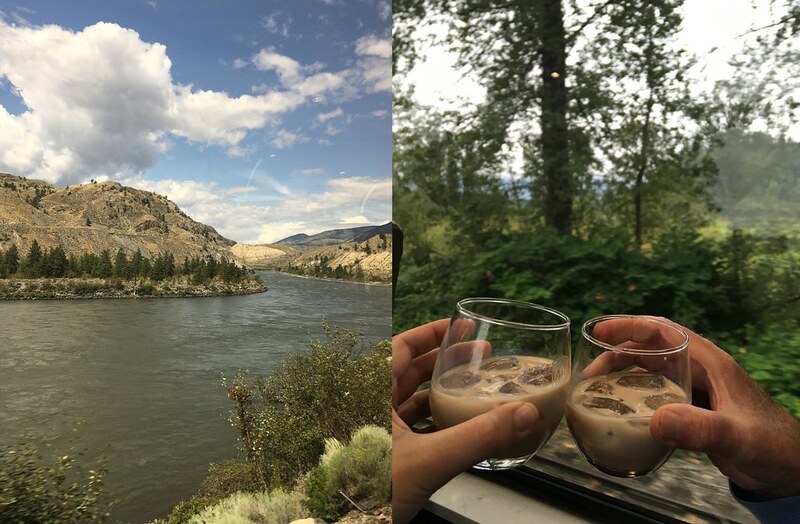 The ride was fascinating: very luxurious, everything was provided and the hosts were so cheerful, constantly walking up and down, bringing refreshments and sharing wonderful bits of information about the incredible views which rolled by. 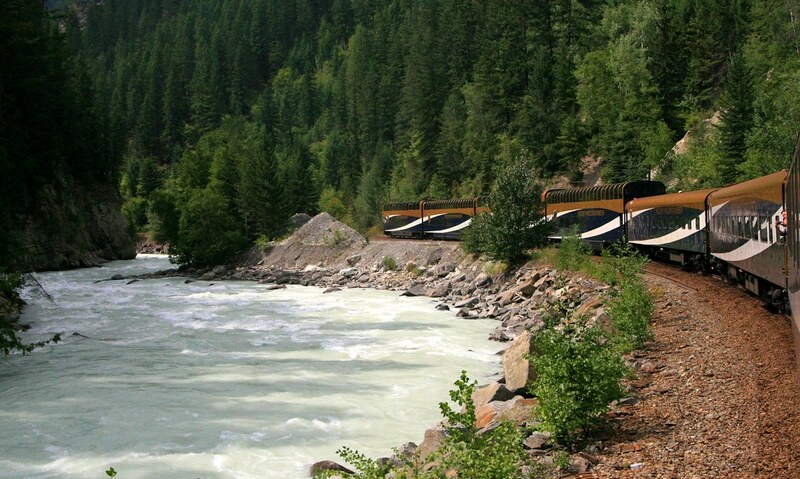 We followed the Fraser river to where it met the Thompson river, following that in turn to Kamloops. We saw ospreys and eagles wheeling overhead or chilling in their giant nests. 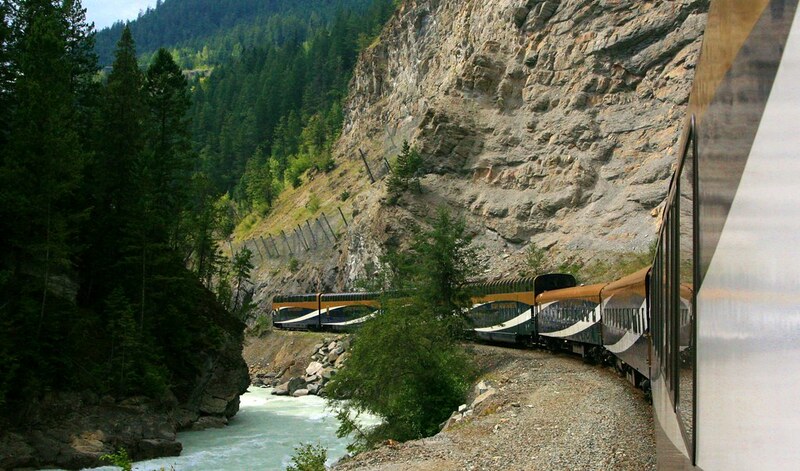 We saw the rapids of Hell's Gate, rolled over magnificent bridges and spied mile-long freight trains with over 170 carriages, rumbling along the tracks. It was truly magnificent. Fluffy clouds skulked over the mountains, before clearing for the afternoon. In the last hour the heavens opened and a lightning storm lit up the sky. 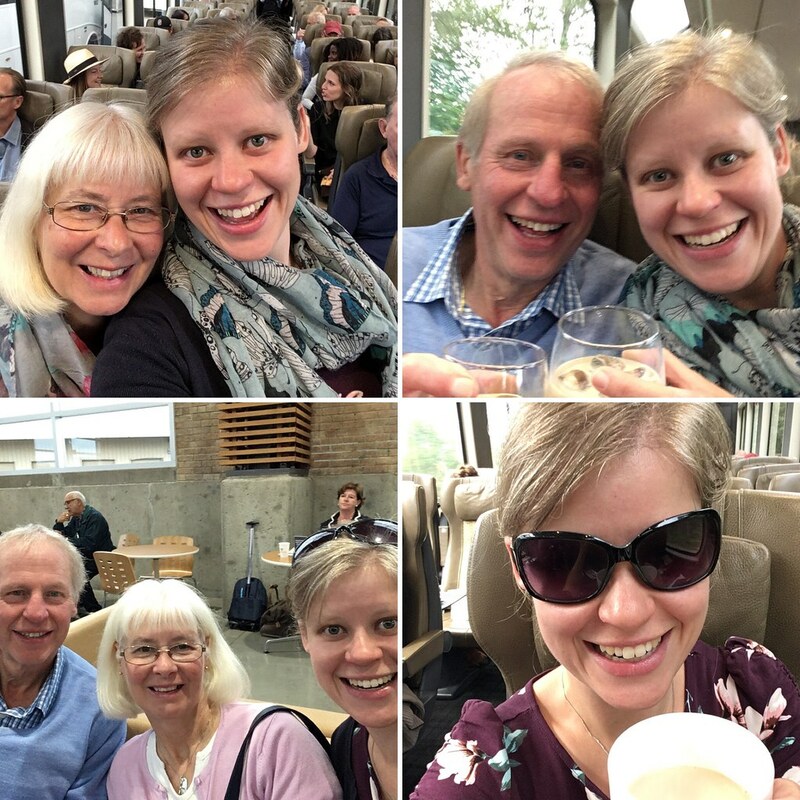 And while this was going on, we enjoyed tea, fruit salad, a cinnamon scone and yoghurt with berries and granola for breakfast, all served to our seats. I could definitely get used to this! Then the bar opened (of course - got to have a bar for elevensies) and it was time for a drink: Baileys on ice. And a little snack to go with, so I had mixed fruit and nuts coated in chocolate. Lunch was a salad (and a huge glass of white wine) followed by salmon in dill sauce with roasted veg and garlic mash, and then finished off with a chocolate brownie served with raspberry coulis and warm chocolate ganache. The afternoon had time for another tea. And another Baileys and snack (a spicy cracker selection, yum!) and then a freshly backed oat and raisin cookie for the last leg of the trip. Brilliant food and it felt pretty fancy. I approve of any situation where I don't have to go more than an hour without being fed. A coach transferred us the 2 minute drive to our hotel (we couldn’t possibly walk) and we eschewed dinner (too full), instead taking a walk through Kamloops’ riverside park in the sunshine. Then there was time for a cuppa and a round of Backpacker before bed. Another early start - we were up at 5:30 to catch our coach back to our carriage, but we were on board, chugging out of the station and toasting our journey by 6:45. Our hosts were cheerful and chirpy as always, and the departure had more familiarity about it this time. I had a croissant, fruit salad and French toast with maple syrup for breakfast. It was yum! 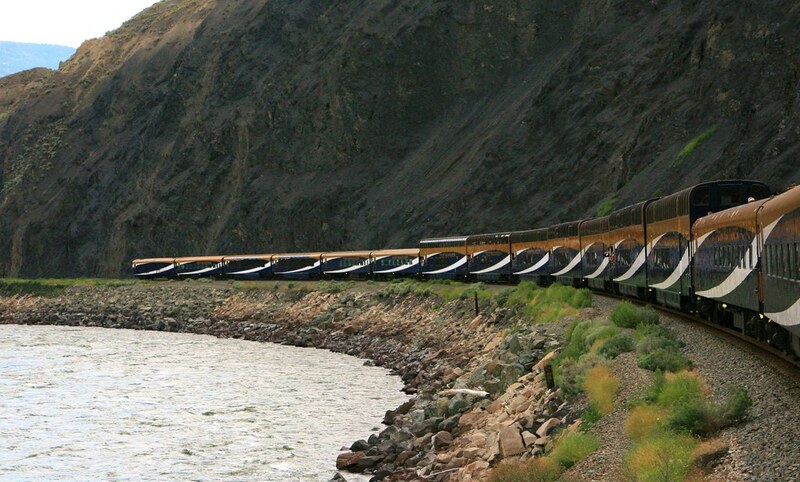 The scenery continued to be the star of the show as we trailed along beside 7 different rivers. 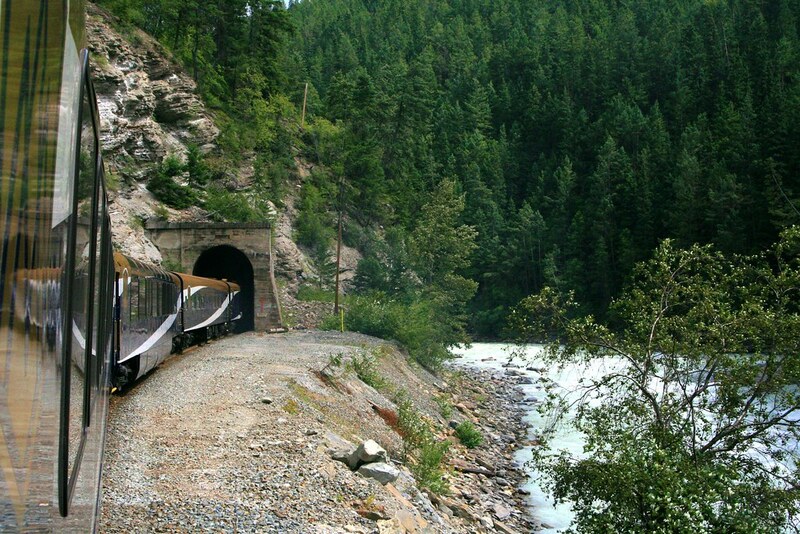 The Trans-Canada Highway wove in and out of our route and we climbed up through the Rockies, gaining elevation by chugging through spiral tunnels cut into the mountain. 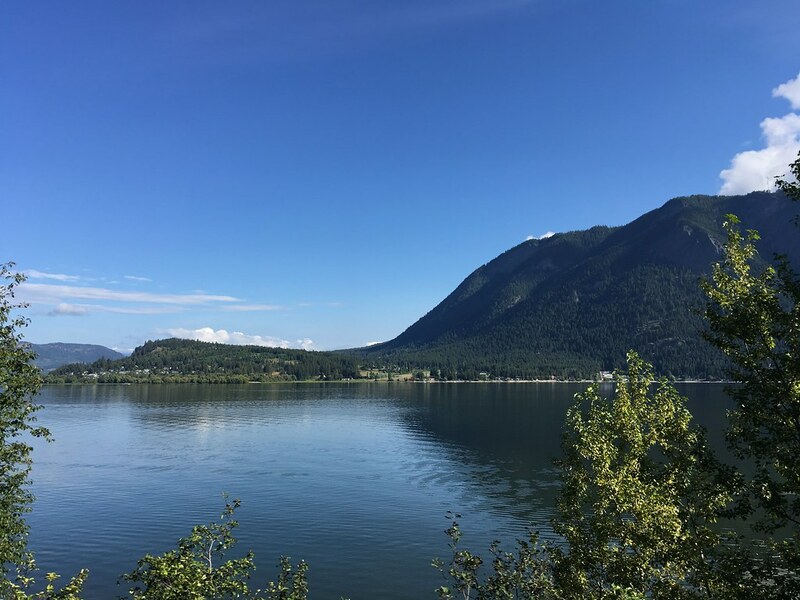 We spotted rafters out on the Kicking Horse rapids, saw eagles soaring overhead and skimmed along the shores of enormous lakes of fantastic shades of grey and blue. There were more snacks (hello earl grey mix: a pinch of earl grey leaf tea with banana chips, dried cranberries, raisins, sunflower seeds and yoghurt raisins), my morning baileys, lunch was a slaw with lime and coriander dressing, followed by prawns in a tomato and vegetable sauce served over brown rice risotto and with roasted veg. And there was cheese cake with berry compote to finish. YUM! 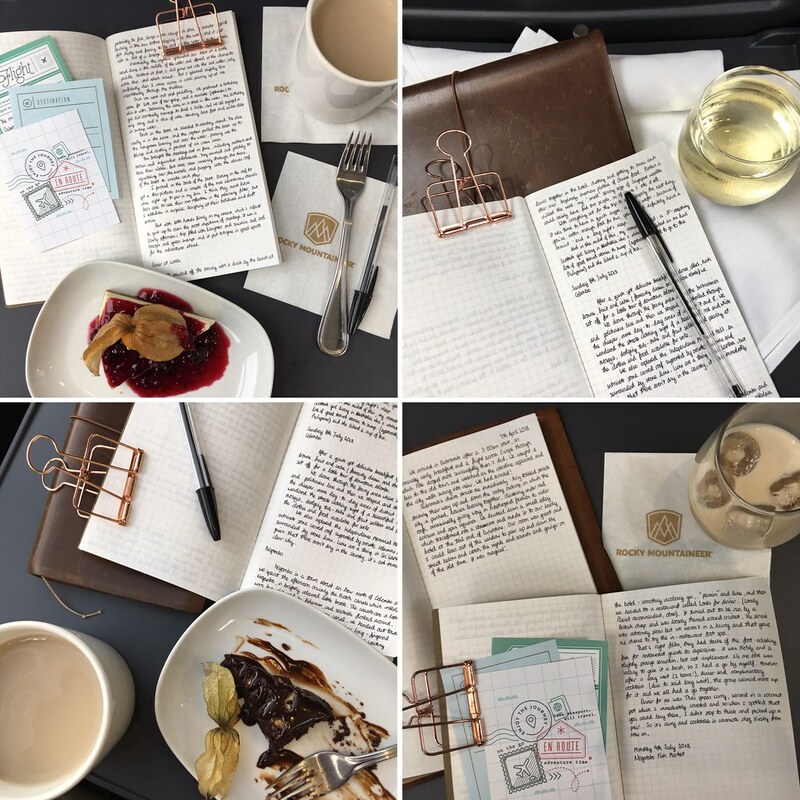 There was also time to get on with a bit of travel journalling as the view slipped past. This is most definitely the life. I rounded off my strenuous afternoon with tea with a splash of Baileys, a combo recommended by the hosts. Not bad! The journey finished with a slightly bizarre sing song to the tune of “We all live in a yellow submarine” except with new words which didn’t really rhyme or scan but sung with enthusiasm by Caitlin, and a singalonga chorus of “we all ride on the rocky mountaineer” There was also a poetry recitation where people in the carriage could read out poems they’d written as a small competition. It was a jovial and amusing end to the ride and we pulled into Banff in high spirits. What an experience!